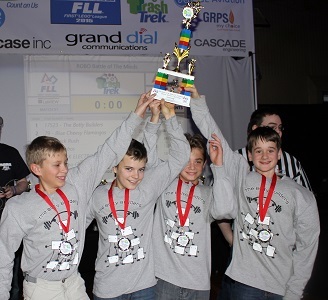 Grand Dial Communications is exited to support the FIRST LEGO League Junior programs. We are partnering with the FIRST in Michiagn, and the Grand Rapids Child Discovery Center to offer an opportunity for local FIRST LEGO League Junior teams to show case their amazing achievements. This year we will have up to 18 teams joining us show casing their research inspired models. Each team has been developing their skills and teamwork inside of the "AQUA Adventure" theme, and have created a model built from LEGO along with their team posts. Come participate with the teams in this fun day of achievement and sharing. Every attendee and participant contributes to the impact of this day for these kids from our community. Bring your familes, friends, and community supports to cheer the kids on. The exposition will afford up to 108 1st thought 3ed graders an opportunity to share their achievement with our community. Through our website, you can register your team (League registration and approval required), or volunteer to assist. We look forward to seeing you there! For us to provide a quality event we need approximate 25 volunteers. This is an outstanding opportunity to have fun and make a difference for a number of kids from our community. Check out our volunteer page for additional information. We need you to make this event possible!